Of all the great composers, it is perhaps Bach who most readily lends himself to rearrangement and reconstitution. Just look to Jacques Loussier or Wendy Carlos for two very famous examples, and I myself have written about the Goldbergs played by a string orchestra (review). 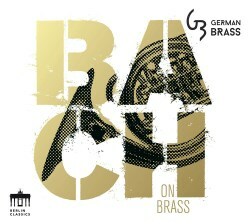 Hence it’s neither surprising nor outrageous to see Bach played by a brass group, and they make a very good job of it. Ironically, however, the numbers that worked best are the ones that are least brassy in their original format. The Easter Oratorio and the third Orchestral Suite sound a little pale in these arrangements, but the oratorio really comes to live in its central Adagio movement which moves with the solemnity and pathos of a funeral procession. The horns are wonderful in the “Air on a G string” and the trumpet often takes the lead elsewhere, such as in the lovely arrangement of the Harpsichord Concerto. Similarly, the lovely Adagio BWV 564 is delightful, as is Ich steh mit einem Fuß in Grabe, with the lead taken by the horns and tuba carrying the theme wonderfully with their dark syntax. The counterpoint actually comes to life more vividly with some movements. The extract from the Well-Tempered Clavier, for example, moves with great clarity of purpose, and the third Brandenburg is as busy, bright and bustling as you’ll ever hear it, remarkably virtuosic in the finale, especially. Most of the arrangements are done by members of the group, and all are worth hearing at least once. Enrique Crespo, one of the group’s trombonists, is entrusted with several, including the famous D minor Toccata and Fugue with which the disc opens, and it has a touch of Stokowski to its realisation. More than that, parts of it sound like the soundtrack to a modern Science Fiction film, but then doesn’t that just make you marvel even more at Bach’s originality and the depth of his genius?